A “West Bank” settler group on Tuesday said the number of people living in Israeli settlements surged at a much faster rate than the overall Israeli population last year and predicted even more rapid growth thanks to the policies of the Trump administration. Baruch Gordon, director of West Bank Jewish Population Stats, said the White House has created a much friendlier environment for the settlers, clearing the way for a surge in construction in the coming years. “It’s just simply opened up. There’s no longer this cloud looming over it,” Gordon said. Gordon’s project conducts an annual study of official population data obtained from the Israeli Interior Ministry. The report is sponsored by “Bet El Institutions,” a prominent settler organization that has ties to some of President Donald Trump’s closest Mideast advisers. The latest data shows the population in Jewish settlements of the West Bank grew to 449,508 as of Jan. 1, up 3.3 percent from 435,159 people a year earlier. In comparison, Israel’s overall population grew 1.9 percent last year to 8.907 million people, according to the Central Bureau of Statistics. The Interior Ministry was not immediately able to confirm the scores of figures, but confirmed it had been in touch with Gordon’s group and said the numbers appeared authentic. The data showed robust growth in settlements across the board, from large towns located near Israeli population centers to isolated communities deep inside the West Bank. Gordon cited several reasons for the rapid growth. An estimated two-thirds of the settler population are religious Jews, who tend to have larger families. In addition, he said the cheap costs of housing have lured many young families that cannot afford homes in Israel proper. But he also said the Trump administration’s attitude toward the settlements is also having an effect. President Barack Obama, like a string of Republican and Democratic predecessors, opposed the settlements as obstacles to peace and put heavy pressure on Israel to halt construction. Trump, in contrast, has done little to stop the construction. While urging restraint at times, the White House has otherwise remained quiet as Israel has pressed forward with numerous developments. This, in effect, has given Israel a green light to lay the groundwork for a surge in construction that should materialize over the next year or two, Gordon said. “Since the change of the U.S. administration, the atmosphere for construction permits has become much easier. They’re being given with greater ease,” he said. “I think possibly the next report and certainly in the ones after that, I think we’ll start to see a huge surge in the numbers here,” he added. The figures did not include data for east Jerusalem, where well over 200,000 Israeli Jews now live. The Palestinians claim both the West Bank and east Jerusalem, areas captured by Israel in the 1967 Mideast war, for a future independent state. They say the settlements are illegally gobbling up their land and harming the chances of a two-state solution — a position shared by most of the international community. Nabil Abu Rdeneh, spokesman for Palestinian President Mahmoud Abbas, called the growth in the settler population a “direct result” of U.S. policy. “The American support for settlements through silence is doomed to failure because there is no peace and stability without an agreement with the Palestinian people and its legitimate leadership,” he said. A U.S. Embassy official said Trump has made his position on settlements “clear” and has received Israeli pledges to take his concerns into consideration. “The administration is firmly committed to pursuing a comprehensive peace between Israelis and Palestinians,” the official said, speaking on condition of anonymity under diplomatic protocol. The report echoed separate findings by Peace Now, an Israeli anti-settlement watchdog group that said last month that Israel has pushed forward plans for thousands of new settlement homes since Trump took office. It also predicted a huge increase in construction in the next few years. Peace Now said the data in Tuesday’s report seemed “logical,” citing the Israeli government’s policy “to encourage construction and relocation to the West Bank.” It said the Trump effect “cannot be seen at this time” because of the lag time between approval of permits and actual construction. Trump’s Mideast team has said it is close to releasing a long-awaited peace plan. Trump’s Mideast team is led by members with ties to the settlements. His ambassador to Israel, David Friedman, is a former president of Bet El Institutions, the sponsor of Tuesday’s report. His chief Mideast adviser, son-in-law Jared Kushner, has donated to the group, and even Trump once sent a donation. In another break from the international community, the team so far has not endorsed the idea of an independent Palestinian state. The Palestinians have already pre-emptively rejected the peace plan, saying the White House is unfairly biased toward Israel. Gordon, the settler researcher, said the latest data should put an end to the international community’s longstanding support for a two-state solution. “Those who continue to talk about a two-state solution, in my mind it’s just a sign that they’re removed from the reality and the facts on the ground,” he said. Well, of course. 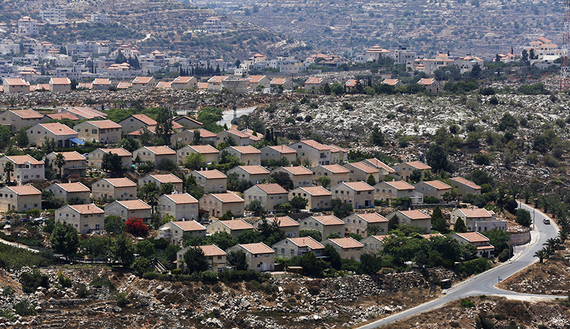 Housing in the center is starved, housing in the settlements is subsidized. Of course the settlements are going to grow. One might almost suspect that this is a deliberate strategy of the Likud government to increase settlement population (and thereby Likud votes). In the meantime, the elderly and Holocaust survivors experience poverty, the periphery of Israel within the green line is languishing, and the economy becomes more and more vulnerable to international conditions with their spikes and slumps. What we have here is a political agenda trumping common sense. If we do lose the West Bank (and we still might) how are we going to pay for rehousing all those uprooted people, when there is already a housing shortage? Finding them new jobs? Getting their kids back in school? We are gambling that there will be a political settlement that leaves us most of the West Bank. The “facts on the ground” bit worked under the British Mandate because they had specific laws that allowed it. That isn’t the case any more. International law is now what counts, and as the influence of the US as a world leader declines, we are entering unknown territory. “settlement population” is Jewish People. “International law” is a bunch of fraud that does not apply to Goym. “If we do lose the West Bank” then Tel-Aviv and Hifa are next.